Uncover the groundbreaking super women who fronted the history of DC Comics! Explore and examine the evolution of the women of DC Comics with this comprehensive comic book cover anthology. You will follow the 1942 introduction of DC Comics' most famous heroine, Wonder Woman, and her various incarnations up to the present day all-female super hero team, Birds of Prey. Discover the creation of comic book spin-offs based on famous characters like Lois Lane. 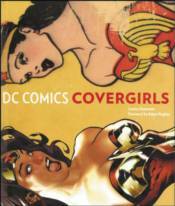 DC Covergirls feature women who prove their power in being both beautiful and strong willed.